The Design Industry Advisory Committee organizes and leads design charrettes to address critical economic, social and environmental challenges and opportunities in Ontario. The charrettes bring together professional designers from the various design disciplines, other experts from industry, academe and government and design students. These one-day events enable participants to share their knowledge, exchange ideas and model creative solutions that will engage support from the wider community. This cross-disciplinary design charrette, developed in partnership with IIDEX/NeoCon Canada, focused on developing a human-centred vision for Toronto’s grand boulevard, University Avenue. On Saturday, November 13th., 2010, DIAC brought eight designers from various disciplines together with tower tenants, City planners and the property management team in a design charrette at the Kipling Towers in Rexdale, Ontario. The objective of the charrette was to explore short-term design opportunities addressing the tenants’ immediate concerns in the areas of signage & communications, exterior recreation areas, waste management, interior multi-purpose rooms, safety and security. The tenants had the chance to discuss their concerns with professionals from the disciplines of Architecture, Landscape Architecture, Industrial, Interior and Graphic Design. DIAC prepared a final report documenting the Charrette recommendations which was published by the City of Toronto in Summer 2011. 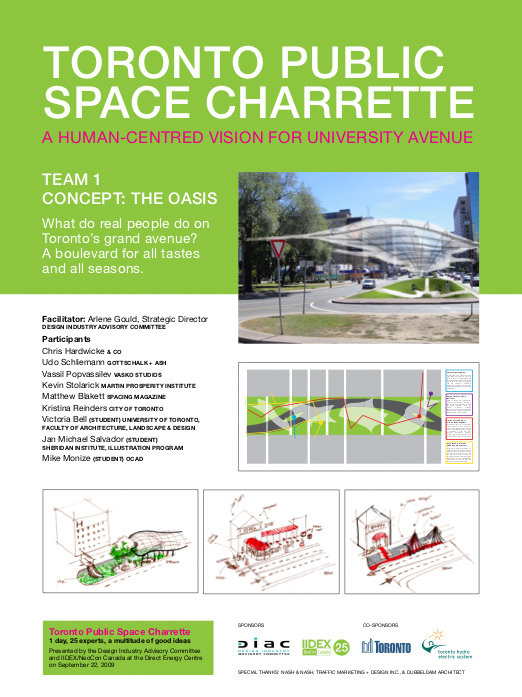 The results of the charrette were summarized in a poster series presented at the Tower Renewal Symposium at Hart House in May 2011.